Here's a pretty fun and interesting Hello Kitty-inspired DIY project! It's a scarf with pockets, and it's perfect for spring. With this idea you can try out different cartoon characters and designs as well, but I stuck with my favorite Kitty! Instructions after the jump! For my own scarf, I prefer to use fabric paint as it is more convenient and fast. The black will be used for the eyes and whiskers, while yellow is for the nose. You will see the painted face later! This is the brand of fabric paint that I use. It dries out smooth and does not look bumpy. 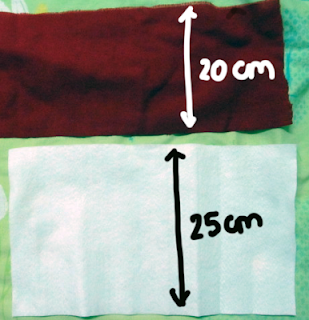 Also, if you prefer to make a thicker scarf for cold weather, you can select thicker knit fabrics. I wanted to use mine for spring and summer, so I picked a thinner old scarf from my closet to remix. 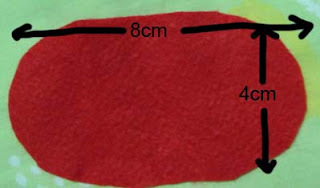 First, cut the red cloth into a rectangle of 120cm by 20cm. Depending on your height, you may choose to make it longer or shorter. 120cm by 20cm is a rough guide. I cut off the tassels from my up-cycled scarf. Cut 2 pieces of white felt with dimension 25 cm by 25 cm. Again, the length is flexible, depending on how deep you want the pocket to be. Also cut 2 rectangles of 8cm by 4cm and make the edges rounded. This will be the bows. Sew on the 2 pieces of white felt/fleece onto the 2 ends of the scarf. Make sure both the white pockets are on the same side! 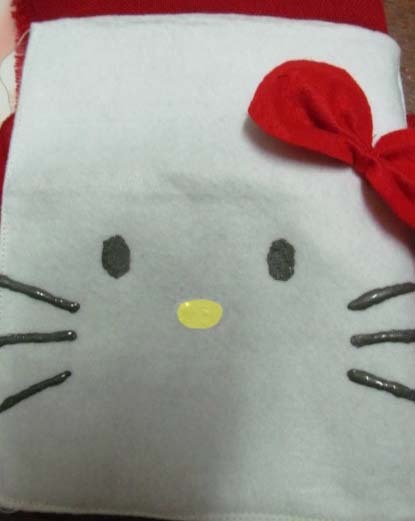 I used a sewing machine to do it, but it can be hand-sewn as well. It can be done by folding over the extra white fabric to the other side/ back of the scarf, and then sewing 3 sides of the rectangle. Leave the top open so that it can form the pockets. Subsequently, sew on the bows on the 2 pockets. 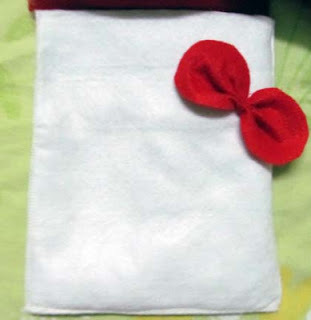 Pinch the rectangle in the middle and sew the middle to form the bow. For this bow, pinching it in the middle with 2 small pleats look great. Painting the face: I used fabric paint, but you can choose to embroider the facial features with thread as well. It will be more time-consuming though. I believe the embroidered one will look pretty good! If you are using fabric glue like me, draw on the features for each face separately. Let one side dry before moving on to the next to prevent smudging. 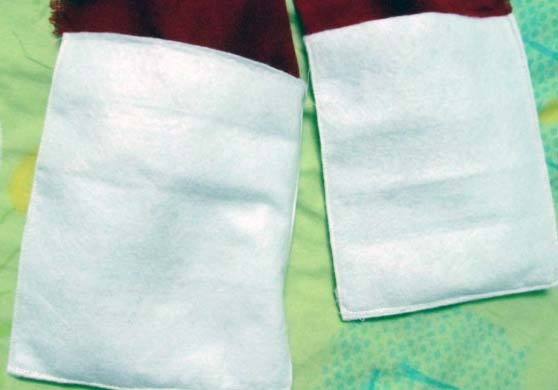 Lay the scarf on a flat surface as the paint dries so that the paint will not run! It'd be good to refer to an image of Hello Kitty to check the proportions of the facial features and where to position them. The completed scarf! Very pretty for spring, and practical too. 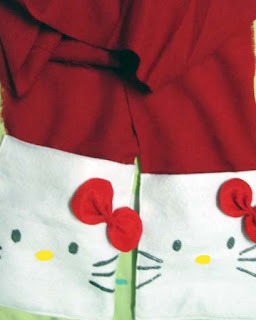 I love to stuff my gloves in the small pockets, and when it's chilly, I can hide my hands behind Kitty's face too.